An evocative meditation on the English landscape in wet weather by the acclaimed novelist and nature writer, Melissa Harrison. Whenever rain falls, our countryside changes. Fields, farms, hills and hedgerows appear altered, the wildlife behaves differently, and over time the terrain itself is transformed. 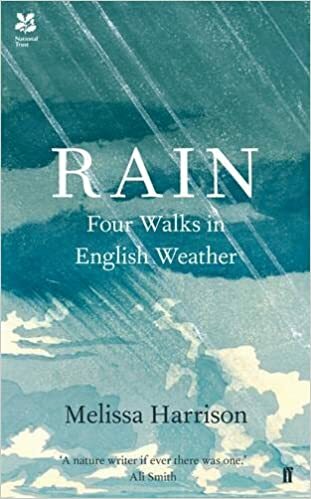 In Rain, Melissa Harrison explores our relationship with the weather as she follows the course of four rain showers, in four seasons, across Wicken Fen, Shropshire, the Darent Valley and Dartmoor. Blending these expeditions with reading, research, memory and imagination, she reveals how rain is not just an essential element of the world around us, but a key part of our own identity too. I’m someone who has walked wild places, often in rain, for many years so this book looked a good match to me. I wasn’t disappointed. This book, Rain, Four Walks in English Weather by Melissa Harrison, is not long but manages to get an awful lot in between the covers. There are only four walks; Wicken Fen (in Winter), Shropshire (Spring), The Darent Valley (Summer) and Dartmoor in Autumn. This means that, in addition to some very varied areas and scenery, seasons are neatly worked in too. In addition there is a section with “100 words concerning rain” which I found very interesting and enjoyed. A little more mundanely (but no less appropriate) there is a glossary of meteorological terms for rain and a worthwhile bibliography. The individual chapters for the walks are very rich in their content. Obviously the walk is described however much more manages to get in. Given the walks I’ve done I do know how the past, future, previous walks, things seen and not seen come into the mind while wandering and the author reassures me I’m not alone in that! This really is far more than simply about walking in the rain. She brings in facets of history, flora and fauna of the areas explored too and in a knowledgeable way. In each case the type of rain affecting the area is explained. Poetry and folklore put in a welcome appearance. Equally while these are about individual walks they are also about the place and times past both in the author’s experience as well as others. For those of us with that very British obsession about the weather generally and rain in particular this book is a joy. For armchair walkers and those who know some of the places it would be a great gift and a book to dip into (maybe on really wet days). Given I do know Dartmoor quite well I cannot help but reflect on that chapter in particular. I found it so interesting and despite walking the moors for years I learnt quite a lot. It also conveyed a lot emotionally which worked for me and reflected some of my feelings about the area. At the end I simply want to go back and read it again. So rich. It may be about rain but it is a lovely book to immerse yourself in!